A new McDonald’s location recently opened in a piazza nearly next door to St Peter’s Basilica in Rome. On 30 December, the new controversial branch opened its doors to the public. The location, a building owned by the Vatican, places the fast food conglomerate and its patrons eerily close to Vatican City, dwelling place of the Pope. 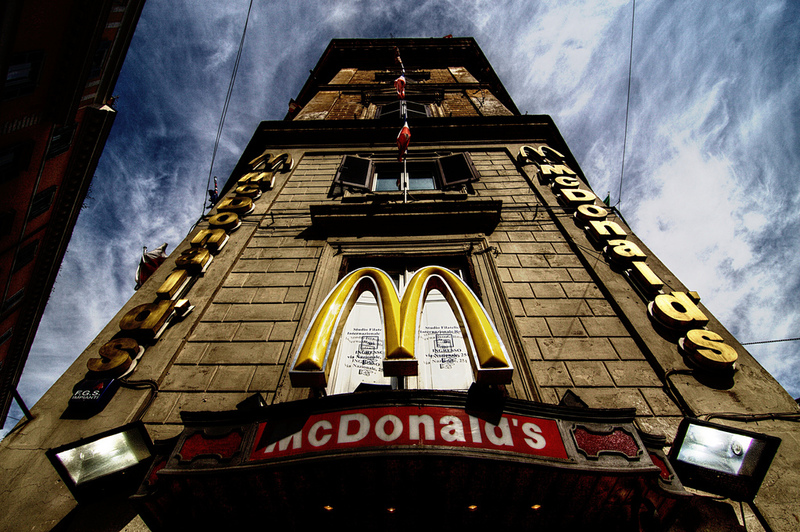 In October of last year, Italian cardinal Elio Sgreccia called the Vatican McDonald’s a “controversial, perverse decision” that was “not at all respectful of the architectural traditions,” according to Fox News. The opening was extremely upsetting to cardinals and those concerned with cultural continuity in the historic city. As if inspired by the holy ground, McDonald’s has teamed up with Italian non-profit Medicina Solidale to provide free food to homeless within Vatican City. Representatives of the charitable organisation approached the management of the new branch after headlines condemning its presence in St Peter’s Square. Spokesperson Gianluca Scarnicci told AFP, “They got back to us inside 24 hours.” As an organisation, Medicina Solidale offers free medical care to those unable to afford it. For the past year, the charity has worked with the Vatican to provide health check-ups and medical care to the homeless. Starting 16 January, 1,000 free lunches will be donated each week. However, for the first run, only 50 meals will be given out. The event will take place every Monday at lunchtime with the fast food chain doling out double cheeseburgers, apples and bottles of water. Volunteers from Medicina Solidale will assist in handing out the free lunches to homeless living in the general vicinity of St Peter’s Square. The free lunch event follows through with Pope Francis’ mission run by chief alms-giver, reports Fox News, who has organised efforts providing homeless with hot showers. Bathrooms have been built just off of St Peter’s Square for that exact purpose. The Administration of the Patrimony of the Apostolic (APSA), the portion responsible for the Vatican’s assets, agreed to rent part of the building to McDonald’s last year. The occupation reportedly nets the Vatican 30,000 euros a month.